Eco-friendly is the way to go. Thanks for everything CEP. Love the designs on this postcard. Came out just the way I wanted. Thanks for the great customer service Custom Earth Promos. Very satisfied customer. Great company to work with. Love the designs on these postcards! Ordered them for a business event and they really stood out! Thank you CEP! I customized several seed paper postcards with my company logo and slogan. I used them to gain exposure by mailing them to potential clients all over the country. Thanks again Custom Earth Promos. Ordered this for the sales department in the office really good way to be eco-friendly. Our company was thrilled with the design work on these postcards. We will be ordering more for the holidays. A wide variety of options make the customization process really easy. Ordered 10,000 of the seed paper postcards for the upcoming holiday season, can't wait to have them in hand. We put our logo on the front and then explained the premise of these seed paper cards on the other. People liked the idea and we got some great feedback. 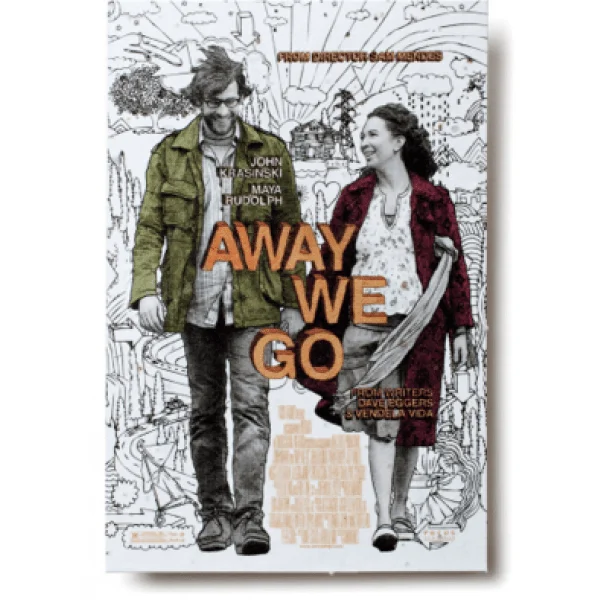 How could I choose another postcard to purchase, especially when you can plant this one and flowers grow? Our team was very impressed with the quality and print of our postcards. Great incentive to "go green". I like the make up of these seed paper postcards. Clients love receiving these postcards during the holidays. A nice way to support the environment too. My boss asked me to me to think outside the box in regards to marketing our company. These post cards where brought to my attention and I couldn't be happier with how well they have helped increase our inquiries. Great delivery time and customer service with Custom Earth Promos. 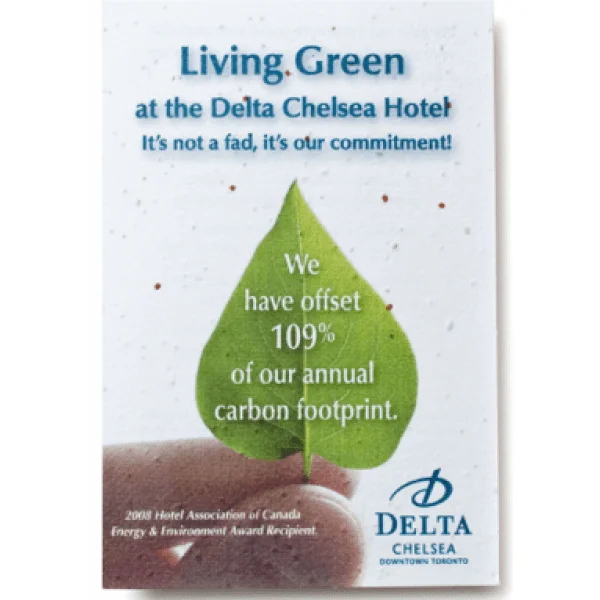 We are ecstatic with the idea of postcards that are 100% eco-friendly in every sense of the word. 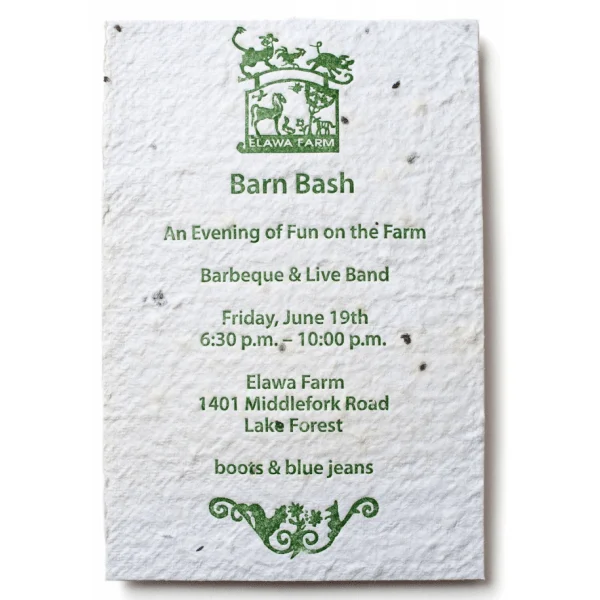 Handmade seed paper is an eco-friendly material that makes a wonderful canvas for promotions and announcements. 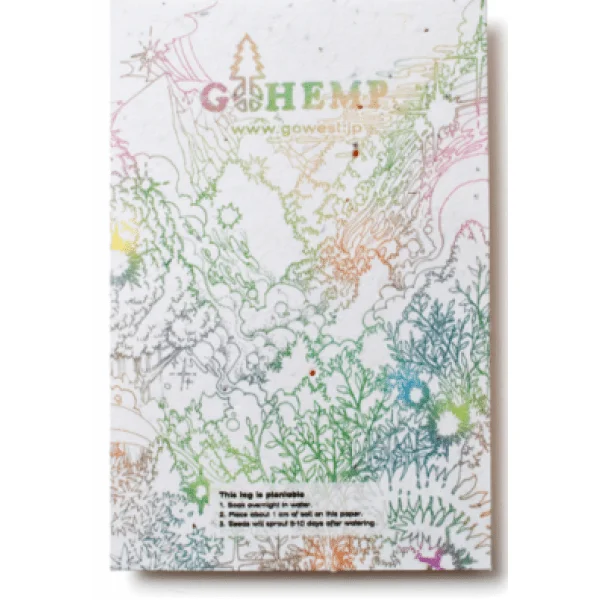 Medium Seed Paper Postcards from Custom Earth Promos are handmade in the USA and embedded with our top performing wildflower seeds with the highest germination rates. A pulp of 100% post-consumer recycled paper is embedded with USDA-approved, non-GMO seeds only and laid out in sheets to dry at our 30 kW solar-powered facility. By carefully monitoring each phase of the production and drying process, we're able to ensure that there is no loss of germination. We also utilize a non-invasive method to spray the all-natural, soy-based pigments we use to color our seed paper. This further eliminates any eco-impact and ensures our high germination rates are never compromised. Medium Seed Paper Postcards are an excellent way to promote a specific campaign while also investing in the eco-responsibility of your brand image, an increasingly important attribute among modern consumers. Customize the 4" x 6" size to meet your specific dimensional requirements. 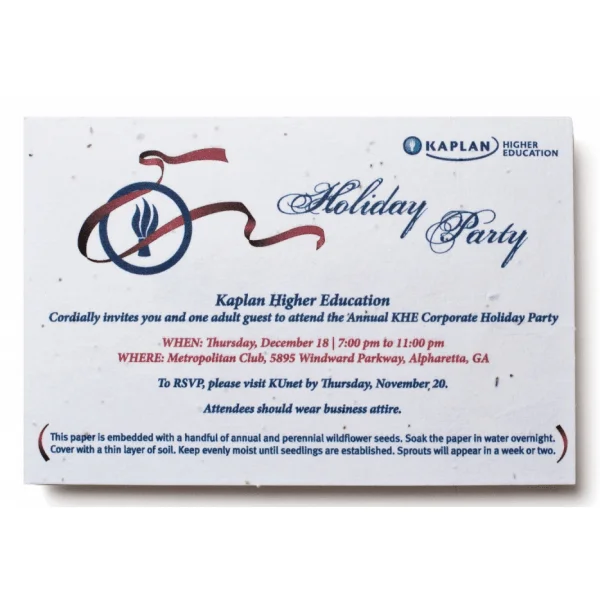 Work one-on-one with our in-house design team to define the custom graphics and colors to display on one or both sides of the eco-friendly postcard to genuinely capture and convey your branded message to a target audience. Sustainable products and practices have quickly evolved to become the single most important factor of influence for consumer purchasing behavior over the past two years, outranking celebrity endorsements and digital presence by unprecedented percentages. As consumers are more commonly practicing methods of sustainability in their lives, such as reducing waste by using recycled totes when food shopping instead of plastic bags, they have come to expect the same from the brands which they give their business to. Eco-friendly practices of waste reduction and sustainability are no longer optional tactics for brands that hope to remain competitive in their industries. Sustainable living brands have grown 30% faster than their less environmentally invested competitors in the last year alone. With staggering numbers that show no signs of slowing, it is crucial for brands to employ eco-friendly campaigns and communicate their efforts of sustainability to remain competitive in their industries and maintain loyalty from their eco-conscious customers. Made an eco-ethical statement that will benefit your brand image for years to come with Medium Seed Paper Postcards. Medium Seed Paper Postcards embody the all-natural founding philosophy of Custom Earth Promos with seed paper made from 100% post-industrial recycled paper and dyed with all-natural, soy-based pigments. Our seed paper is handmade in the USA with USDA-approved, non-GMO, highest germination rate seeds. These entirely eco-friendly products are manufactured in our 30 kW solar-powered facility to ensure no potential harm is done to the environment during production, during use or after disposal. The source of our post-industrial recycled paper is always undyed, guaranteeing seed paper products that are safe for your customers and guaranteed to be free of any potentially harmful chemicals. 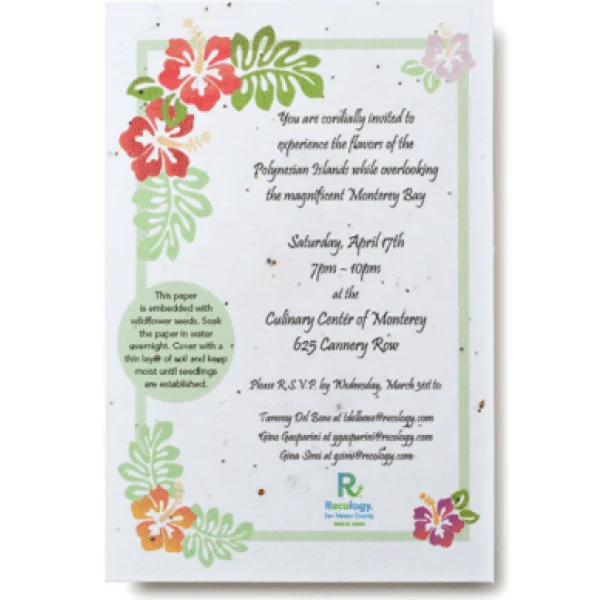 With complete freedom for customizations that include altering the postcard dimensions, pigment, graphic imprint, font, text size and even seed mixture, Medium Seed Paper Postcards are ultimately adaptable to meet your specific branding and advertising needs. Customize your exclusive design today and start investing in the eco-responsibility of your brand image with an eco-friendly product that will grow into a flourishing flower garden. 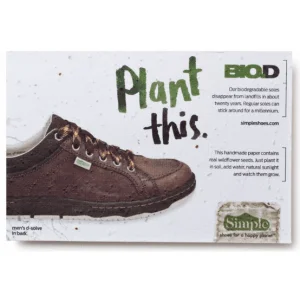 Promote your message with ready-to-plant seed paper that will prove to stand as a testament to the eco-ethics and proactive planetary preservation of your brand! Be sure to ask your design expert about our specialty and seasonal seed mixes to further customize your exclusive order!